When business people discuss ‘Cloud’ they think Salesforce and maybe Citrix or Microsoft, while technologists think Amazon, Google and Rackspace. Business owners want and believe that they can swipe the credit card, and ‘the system’ is ready tomorrow. To technologists, it is a bit more complex than that, but they too want simplicity. To the IT organization if there are no physical goods, servers, tapes, power supplies, then it is not real. To the line of business, they are tired or asking IT for permission, giving IT the upper hand in business application decision making. Therefore, what it really comes down to is this: To the business it is about gaining control, the IT department it is about losing control. Do not underestimate the emotional elements that go into the decision making process surrounding ‘Cloud’. 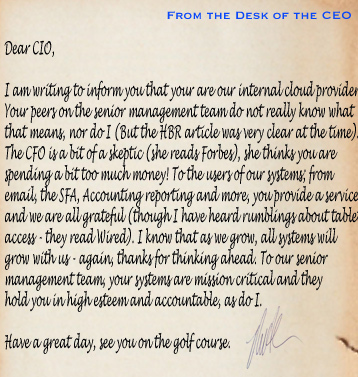 I did not bring up the most important person, the CFO who has read the first half of the Op Ex v Cap Ex article talking about how Cloud is cheaper (the second half is not quite written yet, but it will say that depending upon the application the cost lines cross at between 4 and 6 years). You – the CIO or IT department will be (or have been) asked to do more with less, optimize your computing power, deal with more data, have five 9s uptime, spend less on electricity and drive innovation. You are asked to think about things you never considered to be your job, like cooling systems, how much weight the floor can support, the electric bill and so much more. It is starting to feel a lot like a data center. So, there might just be a cloud and/or data center inside your firewall (physically or logically). In the end, it is as simple as balancing resources, time and money and enabling your organization to sell, support, collaborate and innovate. Do you need cloud in order to do that? An unconditional – It depends. I am looking forward to exploring these topics as well as a few others next week at the CIO Cloud Summit. Maybe I will see you there?